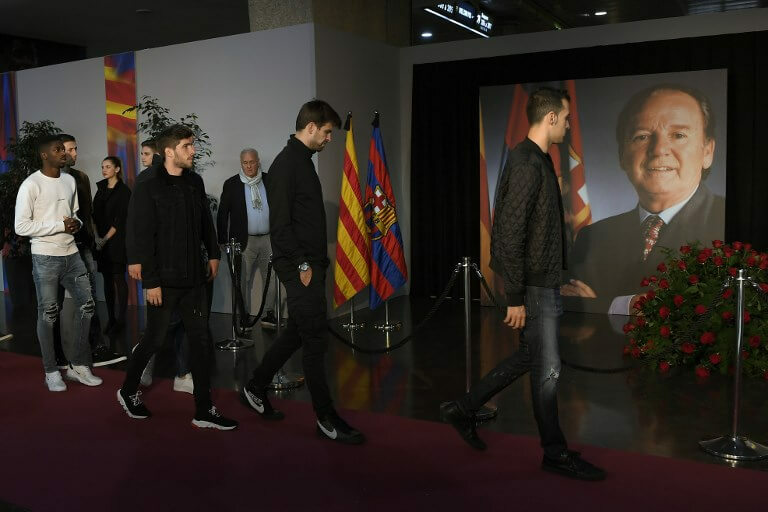 FC Barcelona players today were among those paying their respects to the club’s former president, Josep Lluís Nuñez, who died on Monday, aged 87. A special condolence area was set up at the Camp Nou stadium for Josep Lluís Nuñez (1931-2018), who was the club’s head for 22 years and during the success of their iconic 1992 team. Nuñez recruited several star players over his tenure, from Argentina’s Diego Maradona to Brazilian duo Rivaldo and Ronaldo. But it was in 1988 that he made one of his most influential signings, by appointing Holland’s Johan Cruyff as coach, prompting a radical overhaul of Barcelona’s playing identity. Nuñez had also established La Masia in 1979, the club’s training centre, now famous for bringing through the likes of Lionel Messi, Andres Iniesta, Xavi Hernandez, Carles Puyol and Pep Guardiola. Born in 1931 in the Basque town of Barakaldo, Nuñez moved to Barcelona at a young age. He made his earliest impact on the club in the first democratic presidential elections after the end of the Franco dictatorship, in May 1978. Owner of the construction group and hotels business Nuñez i Navarro, Nuñez spent a few weeks in prison between 2014 and 2015 after he was sentenced to two years and two months for bribing Spanish tax officials.